Photography studio, 1964. Left to right: Richard Amt, Mrs. Alfred R. Bellinger, Geula Pariser, Elizabeth Benson, Julia A. Cardozo, Georgine Reed, Susan Boyd, Alfred R. Bellinger, and Elizabeth Bland. Dumbarton Oaks Archives (AR.PH.Misc.024). In 1944, the Dumbarton Oaks Research Library and Collection began to commit considerable resources, including a full-time staff photographer, to the acquisition and production of photographic images of Byzantine artworks. This collection, now an integral part of the Dumbarton Oaks Image Collections and Fieldwork Archives, numbered 1,300 images in 1944–45 and grew by some 2,000 or 3,000 images annually until it reportedly reached 10,000 images in 1949–50. In 1963, Dumbarton Oaks built its first fully-appointed photography studio and darkroom, located in the basement of the Philip Johnson-designed pavilion for the Robert Woods Bliss Collection of Pre-Columbian Art. In 1964, a new photographer, Richard Amt, was hired to run this studio, and for eleven years he photographed the Byzantine and Pre-Columbian Collections and prepared images for Dumbarton Oaks publications, especially the Byzantine coin catalogues published between 1966 and 1973. A 1964 photograph taken in the studio commemorates the new studio and its first year. Seen from left to right are Richard Amt, pulling a plate from the camera, Mrs. Alfred R. Bellinger, Geula Pariser, an assistant to the photograph collection, holding a photomontage of art images labeled “I am the Camera,” Elizabeth Benson, the assistant curator for the Pre-Columbian Collection, embracing the camera’s double-extension accordion bellows, Julia A. Cardozo, an assistant to Alfred Bellinger, Georgine Reed, the curator of the photograph collection, Susan Boyd, the assistant for the Byzantine Collection, the numismatist Alfred R. Bellinger, a Visiting Scholar, and Elizabeth Bland, the assistant curator for the Byzantine Collection. Richard Amt had been an aerial photographer during his four years in the U.S. Air Force before working as a photo technician for The Johns Hopkins University Applied Physics Laboratory. Having joined Dumbarton Oaks in 1964 as staff photographer, he not only photographed artworks, he also travelled to Cyprus to photograph frescoes in Byzantine churches. From Dumbarton Oaks he moved to the National Gallery of Art as a staff photographer, where he remained for twenty years, becoming chief of photographic services during his last nine years there. For many years I maintained a darkroom at home and made black and white prints from film cameras of various sizes including the 4 x 5 view camera. However, digital photography has brought dramatic changes and I no longer have a darkroom: I now use digital cameras, a computer, and an inkjet printer for my photography. 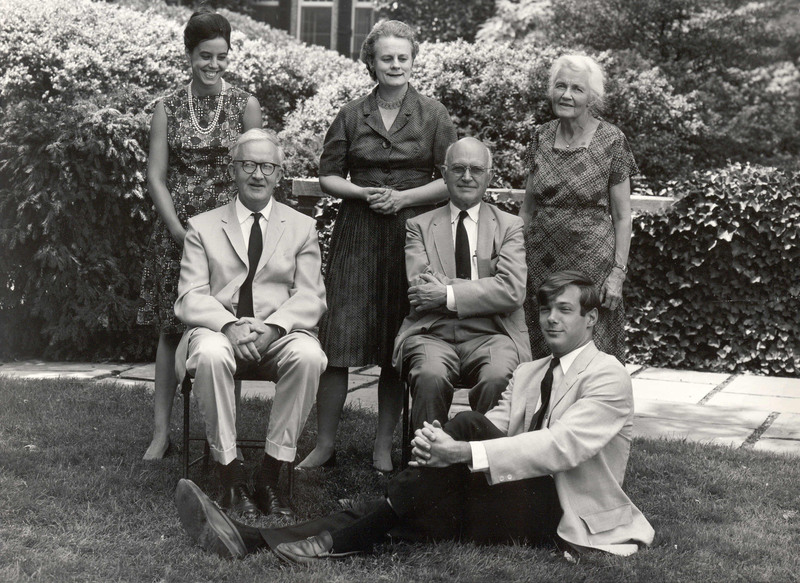 In 1965, Richard Amt also took an analog photograph of the Dumbarton Oaks staff who were involved in the publication of the Byzantine coin catalogues. The image depicts, in the back row, left to right: Julia Cardoza, Julia Warner, the assistant editor for Byzantine publications, and Mrs. Alfred Bellinger. Seen seated, left to right are: Philip Grierson, the advisor in Byzantine numismatics, and Alfred Bellinger. Seated on the ground is Julian Hartzell, an assistant to Alfred Bellinger. Staff photograph, 1965. Back row, left to right: Julia Cardoza, Julia Warner, and Mrs. Alfred Bellinger. Seated, left to right: Philip Grierson and Alfred Bellinger. Seated on the ground: Julian Hartzell. Archives, AR.PH.Misc.181, Dumbarton Oaks Research Library and Collection.